By Eric Katz A broken budget system casts a dark shadow over federal spending. By Mohana Ravindranath CIA staffers take to Twitter to shed light on the agency’s mission. GAO’s Gene Dodaro and David Powner see progress and potential to improve visibility across government programs. By Marcus Weisgerber Foreign defense firms want a cut of U.S. business. By Timothy B. Clark As we bid farewell to the printed page, we look forward to a digital future. 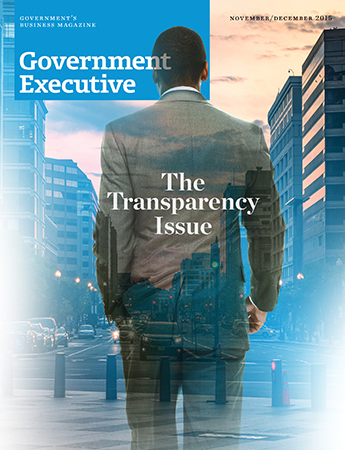 By Tom Shoop The last print edition of Government Executive. "Every American Has the Right to Know"
By Aliya Sternstein President Obama’s push for transparency into government spending may have run out of steam.